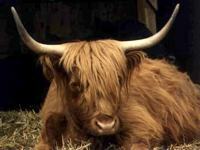 I LOVE COWS. Big, beautiful, breathing cows. I grew to love them when I worked on farms, milking and feeding these peaceful creatures and getting to know their distinct individual personalities. My heart broke each time one of my friends was sent to slaughter, which is the sad reality of farm life. But what could I do? I made their lives as decent as possible while they were in my care, then I had to kiss them goodbye. Until the storm: a huge spring storm that lasted most of the night, with roaring thunder and lightning bolts hurtling down with deafening cracks. In the morning, when I went out to feed the cows, I found them beneath a split and blackened tree, all dead. Six little calves huddled together a few feet away. As I led the orphans back to the barn, something inside me changed. The years of accepting sad reality were over. If these little guys had survived an act of God as powerful as that storm, they sure weren't going to be killed by an act of man, not if I could help it! That's how the cow sanctuary began. Trouble was, I wasn't a rich heiress. I was a farm worker making minimum wage. These calves weren't even mine. They belonged to the man who owned the farm. How was I going to save the calves? I exchanged six months' wages for the lives of those calves. Never was money better spent, I thought as I hugged them. But what next? They were growing fast and would soon weigh at least half a ton each. No matter how hard I worked, farm wages weren't going to be enough to feed them. "How? How? How?" filled my thoughts. The answer came to me as I lay in the straw snuggling with my cow family: I'd make life-size stuffed cows for others to snuggle the way I snuggled with my real cows. Then again, "How?" I'd made an apron and an A-line skirt in eighth grade Home Ec class, but that was the sum total of my sewing experience. The answer to this "How?" came most amazingly. Knowing only that I had to start with material, I bought several yards of fake fur at the fabric store. One evening after the feeding was done, I sat on a bale of straw and stared at my package, wondering how in the world to begin. 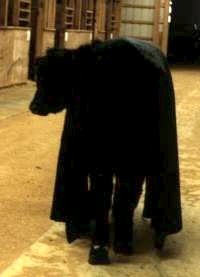 As I sat, Harvey, my favorite cow, came to the barn door and mooed to come in. This was unusual; he almost never left the others. I looked outside and saw that the cows had all gone down to the woods, which is what they usually did after eating. "Maybe Harvey wants a treat," I thought, and offered him grain. He didn't take it, though he loved grain. He followed me around as I swept the floor so I could lay out the material on it. When I moved, he followed at my heels. When I stopped, he stopped. This is not how cows behave. I sat back down on the bale of straw and looked at him. "What do you want, Harvey?" I wondered aloud. He, of course, said nothing, just looked back at me calmly with his huge brown eyes. "Could it be," I thought, "that he's offering to help?" I took the material out of the bag and, instead of laying it out on the floor, draped it carefully over Harvey's back. He continued to stand calmly. Suddenly, it became obvious how to make the pattern. I chalked lines where his legs were and cut away the extra fabric. Harvey stayed perfectly still. I used duct tape to hold the pieces together, not wanting to risk sticking him with pins. For five hours, Harvey stood perfectly still while I fitted the pieces of material around him. Finally, he was completely enveloped in a fake fur cow suit. I marked the pieces, then took them off him. When I was done, he moved for the first time; he went to the door and asked to go out. I walked him to the woods to join the others, awed by what had happened. Then I went back to the barn and sewed the pieces together. By sunrise, the first Cowch was born. Eighteen years have passed since then, and the Cowches have fed the cows the whole time. I make them on an old Singer sewing machine, next to a window through which I can watch my cow family grazing peacefully. The first Cowches were pure black, like Harvey. Later I began to make others, also portraying real cows. I made a black and white Cowch in honor of the very first cow that befriended me at the dairy farm 20 years ago. Her name was #9. She was a sweet, gentle Holstein with a perfect heart in the middle of her forehead. I miss her still. Oblainka is an old, blind cow that used to live in the field that adjoins my cows' pasture. Her owner was a rodeo cowboy who had used her as a practice cow when she was young. She lost her eye struggling against him. When winter came and the grass died down, I realized that the cowboy wasn't bringing his cows hay. I knew it wasn't any of my business, but I couldn't ignore their frantic bawling. I threw hay over the fence for them, too. When I noticed the old, blind cow being pushed out by the stronger cows, I started to take an extra slice for her around the corner, hidden from the others. She caught on quickly, and by the end of the week I found her waiting in the hidden place. Eventually, the cowboy brought them food and they stopped bawling when I went by, except for Oblainka, who kept waiting in the special spot. I was touched, and began bringing her a little pan of grain each day. We did this for a year. One day the cowboy came with his trailer and started to take Oblainka away. "She's not bred," he explained. "Can't afford to feed her if she won't give me a calf." "What's she worth," I asked. "Sixty cents a pound," he said. I gave him the money and Oblainka became one of the family. Eight months later, I noticed her udder beginning to swell. Can't be, I thought. She had become fatter, but I was sure it was because she was getting more to eat. Not so. In three weeks, Charlie was born. A couple of months later, I got a phone call asking if I could give another cow a home. Her name was Beatrice, and she was a 4-H cow. The girl who had raised her had become a vegetarian and was determined that nobody was going to kill and eat her friend. Unfortunately, the 4-H club was Beatrice's legal owner, and the club sold her at auction. The girl discovered to which slaughterhouse Beatrice had been sent and went there. She put a rope around Beatrice's neck and walked away with her. They walked for five miles until they reached a barn, where the girl hid Beatrice then started making phone calls, looking for help. People for the Ethical Treatment of Animals (PETA) quickly raised the money to buy Beatrice's freedom, then contacted me. How could I say no? Beatrice became one of our family, and Cowches grew horns. When I heard about another cow sanctuary in Canada, I was eager to visit. As I was being introduced to the cows, I noticed that the cow named Amazing looked as if she was getting ready to have a calf. "Impossible," I was told. "We do no breeding here. 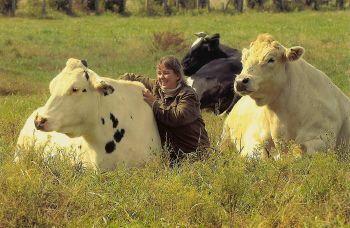 Our cows are old cows who were being sold to slaughter because they couldn't get pregnant." "She looks just like Oblainka looked three weeks before Charlie was born," I told the man who ran the ranch. 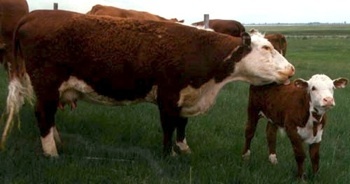 "Perhaps I'm mistaken, but it sure looks to me like you'll have a new calf soon." Three weeks later, I got a phone call. "We've named him Surprise." These are just a few of the stories. As the years go on, I'm sure there will be many, many more. My hope is that the Cowches will continue to feed the cows. But I hope they will do even more. I hope they will make people think.